Look, you know the Chiefs’ best quarterback of the last decade. You know the team’s best receiver, and you know the team’s best tight end. The best running back might take you approximately two seconds longer to think of. This is not a team with a lot of mystery. Which is not to say the last decade hasn’t been good! It has! The Chiefs have four division titles and six playoff appearances since 2009, including three straight titles. They were just maybe the league’s most exciting team, and they have probably the league’s most exciting player. It’s been a great wide. It’s just, for the purposes of this piece, been a pretty predictable one. Let’s take a look at the best Chiefs fantasy seasons of the last decade. Alex Smith drew glowing reviews for his 2017, when he finished as QB4 and set numerous personal records. It was a great year. It was also a solid 120-plus points behind what Mahomes just did in winning the MVP and setting the all-time record for QB fantasy points. Will Mahomes ever have that sort of season again? Probably not. Because no one reasonably can. That doesn’t diminish whatever Mahomes does with the rest of his career. The Chiefs once famously went an entire 2014 season without a single wide receiver touchdown. In 2018, Hill scored 117 seconds into Week 1. That’s just one piece of it, as Hill went on to put up the Chiefs’ best receiver season of the last decade by nearly 60 points. With Mahomes throwing him the ball, Hill is a perfectly fine WR1 for who knows how long. Kelce, Kelce, Kelce, Kelce, Kelce. The Chiefs have had six tight ends top 100 PPR points in a year in the last decade, and the top five are all named Travis Kelce. (Tony Moeaki was the sixth, with a paltry 120.6 points in 2010.) 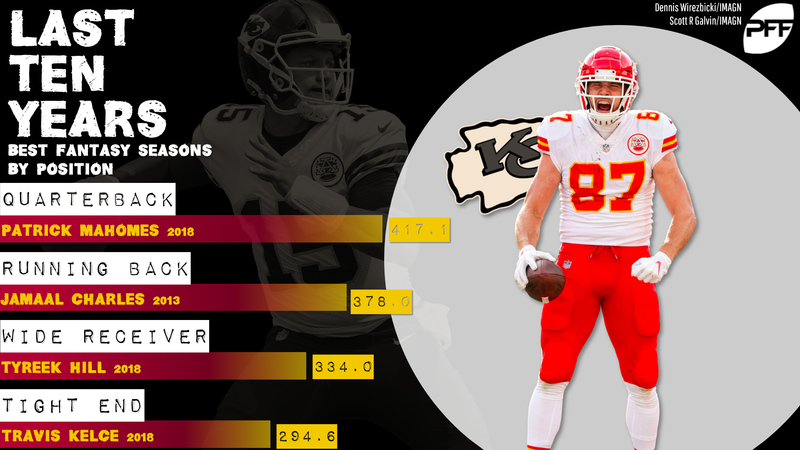 Kelce would have set the all-time tight end yardage record last year if George Kittle hadn’t set it by even more, and his five-year run as one of the league’s elite tight ends stands up there with any run by Rob Gronkowski or Tony Gonzalez. He’s an all-timer.